alaTest has collected and analyzed 771 reviews of Amazon Fire HD 8 (2018). The average rating for this product is 4.5/5, compared to an average rating of 4.5/5 for other products in the same category for all reviews. People really like the camera and usability. The battery and price also get good feedback. Some have doubts about the size and GPS navigation, while there are mixed opinions on the portability and design. 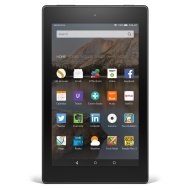 Special-offers feature is annoying; Poor camera quality; No access to Google apps ; The 2017 Amazon Fire HD 8 is a great value, offering a long-lasting battery and decent performance for just $80. Soft speakers; Weak cameras ; With its durable chassis, powerful parental controls and rich content library, the Amazon Fire HD 8 Kids Edition is the children's tablet to beat.